The dichotomy is real. 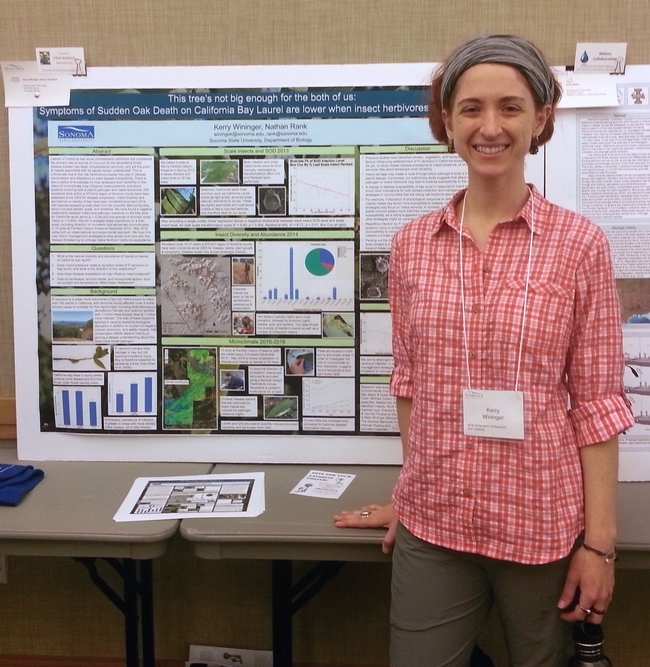 Annually since 2006, Garbelotto's Lab has run a successful state-wide citizen science “SOD Blitz” campaign in each infested or at-risk California county; UCCE Sonoma coordinates this county's efforts. 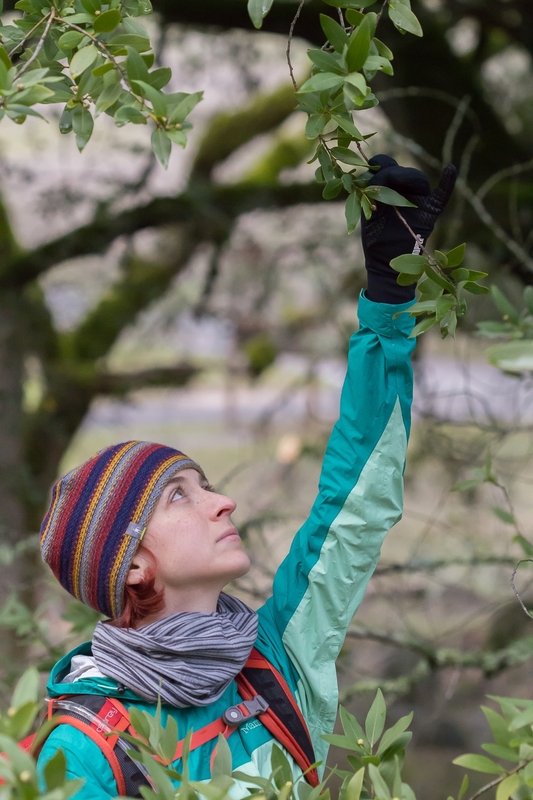 Volunteers in the community, from high schoolers to retirees, collect symptomatic leaves of the two trees most likely to spread the disease to oaks, California Bay Laurel and Tanoak, then Garbelotto's lab tests them. Results from the most recent Blitz show the largest increase in cases of Bay and Tanoak infections by Phytophthora ramorum, the causal agent of SOD, since the surveys began3. Get help: If you're a landowner and have plants with suspicious symptoms, call a tree care professional experienced in SOD management. Reach out to the Sonoma County Master Gardener SOD Specialists. Post a TreeFAQs question for the experts. Plant purposefully: When choosing new plantings or replacing trees, look for non-susceptible hosts. Don't plant foliar hosts uphill or adjacent to canker hosts. Be active in your community: Join a SOD Blitz! Come to a meeting. Stay educated. Spread the word. The estimated true infection rate of Sonoma county trees more than doubled since just last year. A new outbreak has appeared in the coastal area of northern Sonoma County, and infections have re-emerged in areas from which the disease had previously retreated during the drought. Further afield is the most striking, and discouraging, discovery from last year's Blitz – multiple infections were detected in San Luis Obispo, more southerly than ever previously documented, paving the way to add a 16th county to those listed as infected in the state. Infection was also observed in the hot eastern vicinity of Ukiah for the first time, startling researchers who are accustomed to the pathogen's preference for moist, cool areas. Other findings include two new possible host species in the San Francisco Botanical Garden at Strybing Arboretum, the first detected infections on Mt. Diablo in Contra Costa County, and an outbreak in southern coastal Mendocino County. On the upside, substantially more trees were tested during this last blitz than in recent years, novel areas were sampled, and new participants joined the ranks of Citizen Scientists. New treatment recommendations out of the Garbelotto Lab show promise in helping individual trees more safely and effectively decrease their chances of infection if done so before exposure to the pathogen4. Why should land owners and managers, businesses, and the public care? 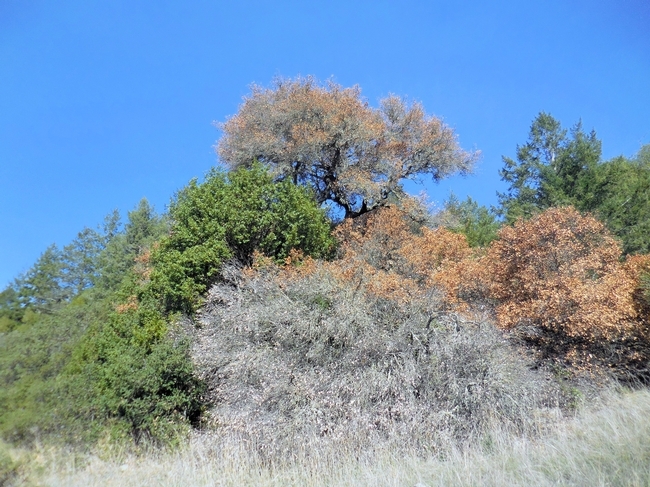 Sudden Oak Death poses many apparent threats as well as those that are less obvious. 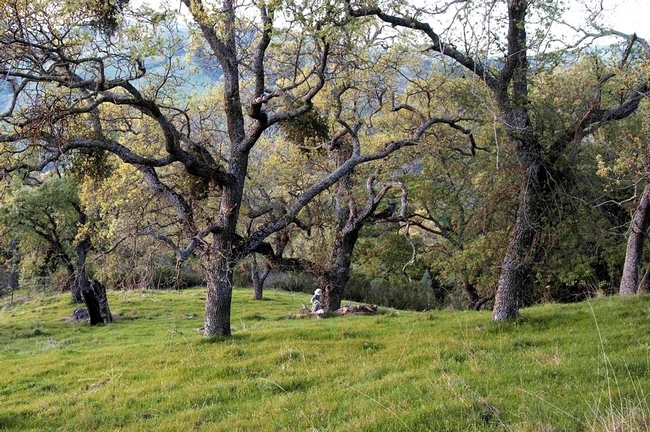 The dramatic loss of oaks and tanoaks impacts biodiversity, nutrient and water cycling, forest microclimate, wildlife, and erosion. There is the potential for increased fire risk and severity in areas with dead and downed trees, creating a safety hazard (Forrestel et al. 2015). Recreation in forests is altered (Kliejunas 2010). Traditional cultural practices are impacted. Even human health concerns such as transmission of Lyme Disease have the potential to increase (Swei et al. 2010). Lastly, economic consequences of SOD to land owners, municipalities, nurseries, and industry are estimated in the tens or even hundreds of millions of dollars (US GEO 2006). Now, more than ever, it's important for scientists, educators, professionals, and the community to come together. Though the news is disheartening, and attention may be elsewhere, collectively we can help slow the spread and cope with this disease that threatens to unhinge native California ecosystems and all that they impact. Kerry is the new Sudden Oak Death Program Coordinator for UCCE Sonoma County, “I enthusiastically follow in the footsteps of the esteemed Lisa Bell, and am already in awe of the great work the Master Gardener SOD team does. I am eager to help get the word out about this challenge and how to face it, and hope to implement new ideas related to SOD content in environmental education and trainings for tree care professionals.” Kerry has an undergraduate degree in Biology from UC Berkeley, and has worked with various environmental organizations as a researcher, educator, naturalist, and communicator while pursuing a Masters Degree on SOD and insect herbivores of bay at Sonoma State University. She has presented research at conferences, such as last summer's SOD6 Symposia in San Francisco that garnered international attention5, and the California Forest Pest Council Annual meeting that this year focused much more on drought-induced beetle attacks in the Sierras than it did on SOD6. 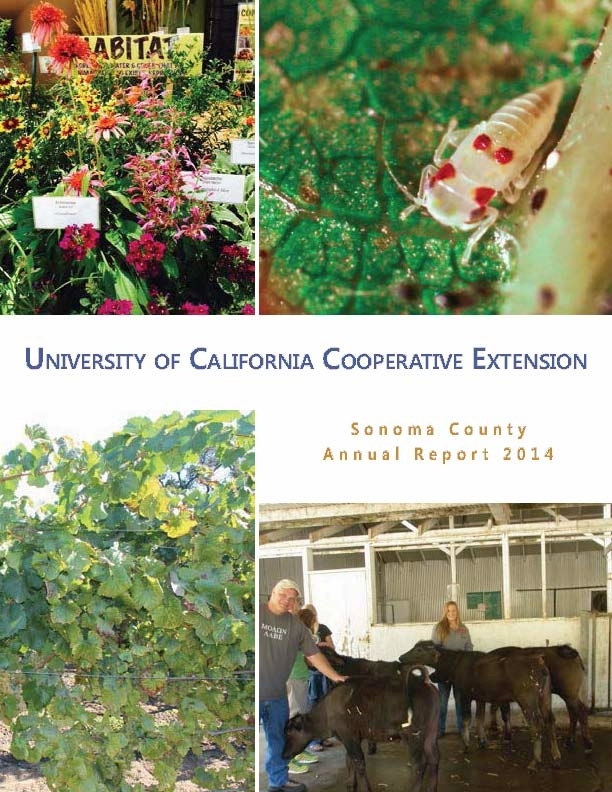 If you are interested in learning more or getting involved, please contact Kerry Wininger kwininger@ucanr.edu. Forrestel, AB, Ramage, BS, Moody, T, Moritz, MA, Stephens, SL. 2015. "Disease, fuels and potential fire behavior: Impacts of Sudden Oak Death in two coastal California forest types." Forest Ecology and Management, 348: 23-30. (GAO) US Government Accountability Office, 2006. Invasive Forest Pests: lessons learned from three recent infestations may aid in managing future efforts. Report from the United States Government Accountability Office to the Chairman, Committee on Resources, House of Representatives. Kliejunas, JT. 2010 Sudden oak death and Phytophthora ramorum: a summary of the literature. US Department of Agriculture, Forest Service, Pacific Southwest Research Station: General Technical Report PSW-GTR-234. Swei, A; Ostfeld, RS. ; Lane, RS. ; Briggs, CJ. Oecologia. 2011. Effects of an invasive forest pathogen on abundance of ticks and their vertebrate hosts in a California Lyme disease focus. 166(1):91-100. SOD: There's an App for That! UCCE Berkeley Specialist Dr. Matteo Garbelotto, of UC Berkeley Forest Pathology and Mycology Laboratory, presented recent Sudden Oak Death research results to 53 Sonoma County homeowners, arborists, and tree service workers. The presentation detailed the management practices necessary to protect oaks and the resources available to help. Garbelotto presented guidelines for California bay tree removal—the first defense in preserving your susceptible oak trees—as well as dosage changes in chemical treatments for oaks. SODMAP Mobile is an app for tracking SOD. This App calculates the risk to your oaks based on real SOD monitoring data. In Sonoma County, these data are created mainly by the public each spring during the SOD BLITZ, an educational, data-collecting weekend led by the Sonoma County SOD program coordinator, Lisa Bell, and the UC Master Gardeners. 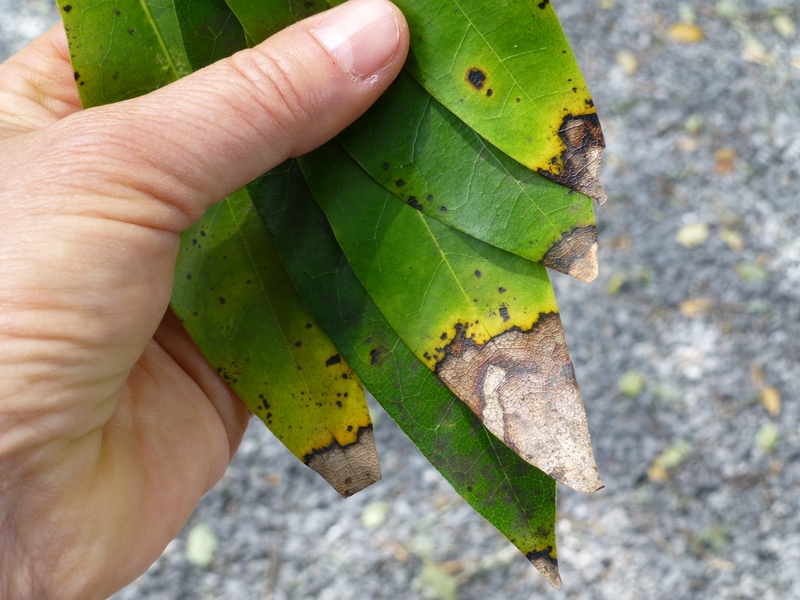 Photo from SODMAP Mobile shows infected trees, marked with red pins, along a road near Freestone, Sonoma County. 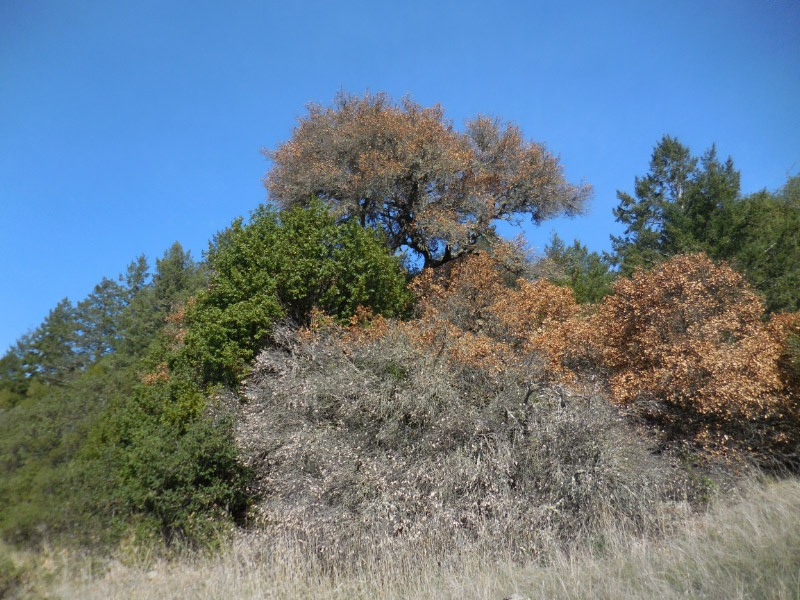 Learn more about Sudden Oak Death in Sonoma County. What is the Sudden Oak Death Blitz? This activity is enjoyed by adults and children. It is a great school project. You will become officially a citizen scientist and your published disease distribution data will help save our oaks. All at no cost to you. Tree care specialists attending the training can bring in clients' samples. 10-11 a.m. Saturday May 30, 2015. Graton: Graton Community Club at Main and N Edison in Graton. Map and Directions. Cloverdale: Cloverdale Historical Society, 215 N Cloverdale Blvd. Map and Directions. Oaks become at risk if the disease is within 200 yards from them! Find out if SOD is 200 yards away, here's how. 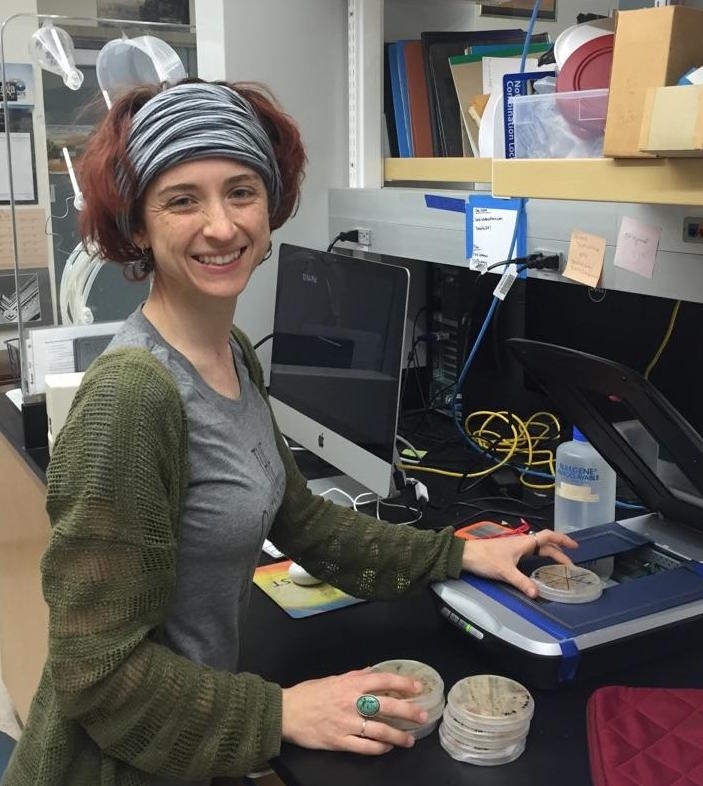 A message from Matteo Garbelotto, SOD Researcher, UC Berkeley: Many of our tree species are susceptible to SOD and several oak species and tanoaks can be killed in large numbers; in the worst sites 70-100% of trees are dead. Since its introduction, the disease has been spreading slowly but steadily and now it is present in 15 contiguous counties from Humboldt to Monterey. In about 15 years of research we have found several effective control measures, but these need to be applied before oaks are infected. Oaks become at risk exclusively if the disease is within 200 yards from them!! What can you do about Sudden Oak Death? One of the greatest assets of our State is no doubt the vastness and richness of our natural environment. Unfortunately, such vastness is constantly being eroded by both natural and human-induced events. Sudden Oak Death aka SOD is one of those environmental threats belonging to the second category, having been introduced in the latter part of last century from an unknown location outside of North America. Many of our tree species are susceptible to SOD and several oak species and tanoaks can be killed in large numbers: in the worst sites 70-100% of trees are dead. Since its introduction, the disease has been spreading slowly but steadily and now it is present in 15 contiguous counties from Humboldt to Monterey: in about 15 years of research we have found several effective control measures, but these need to be applied before oaks are infected. Oaks become at risk exclusively if the disease is within 200 yards from them!! That is the good news. In order to determine disease distribution at such fine scale, we need the help of volunteers from communities throughout the coastal communities of Northern California. 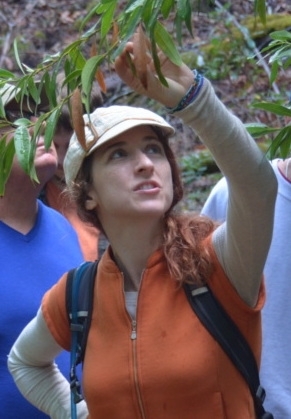 Each year in the spring, there is a massive surveying effort organized by U.C Berkeley with the help of organizations such as the California Native Plant Society and the US Forest Service. This effort represents one of the strongest and now prolonged “citizen science” effort not only in the State, but in the whole country. The volunteer-based surveys have been dubbed SOD BLITZES and we are asking you to join the effort: we need your help to track this tree killer and to inform the population at large. All data generated by the BITZES is made public through the web, an APP (SODmap mobile), and the media. The data allows for the determination of risk of infection for oaks with the simple touch of the risk button on the App. For the past 9 years citizens like you have been helping, and this help has resulted in the identification of several new outbreaks and in the eradication of some of these outbreaks. If your county is not extensively colonized by the disease, your effort will allow to exactly pinpoint its current distribution. This means knowing where extra care is warranted to avoid further spreading SOD, and knowing where business and leisure can be enjoyed without risking further disease spread. The volunteer-generated database is the most complete database for a forest disease anywhere in the world, including almost 20.000 points. The SOD Blitz is in the spring because that is the time when SOD symptoms are easiest to spot. You can join and then sample wherever you desire in coastal California.